Self distribuzione / RIDILLO - Pronti, Funky, via! Warning! 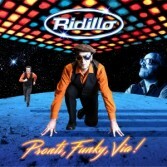 The new album of the Soul-Funky "Ridillo" group, which comes out in CD and vinyl versions, is ready. Born in the 90s straddling the provinces of Mantua-Verona-Reggio Emilia, it soon became known throughout Italy among the enthusiasts as a group capable of involving Funky even in Italian. Particularly well-known in the province of Verona, where he drifts in the local areas of the city and Lake Garda, where he is followed by numerous fans. In addition to the brand new songs, including a duet with Ronnie Jones and Marina Santelli, some revisits of the greatest hits like "Sons of a good star", "Mangio Amore" and others.